The Vedas are a voluminous body of knowledge. Often compared to a desire tree, they provide guidelines for people at all levels of consciousness to fulfill their desires. Vedic knowledge can be ambiguous because guidelines for people at one level of consciousness may not apply at another level, and readers may not be able to figure out what applies to which level. The Vedas are like an unabridged dictionary. Just as finding thirty-five meanings for one word can overwhelm a linguistic neophyte, the many Vedic guidelines on one subject can overwhelm a religious neophyte. How can we go beyond such ambiguity in the Vedas? Just as finding thirty-five meanings for one word can overwhelm a linguistic neophyte, the many Vedic guidelines on one subject can overwhelm a religious neophyte. By going to their source. The Vedas are divine in origin, and Krishna is the highest manifestation of divinity. So, he is the best authority for conveying the Vedic essence. 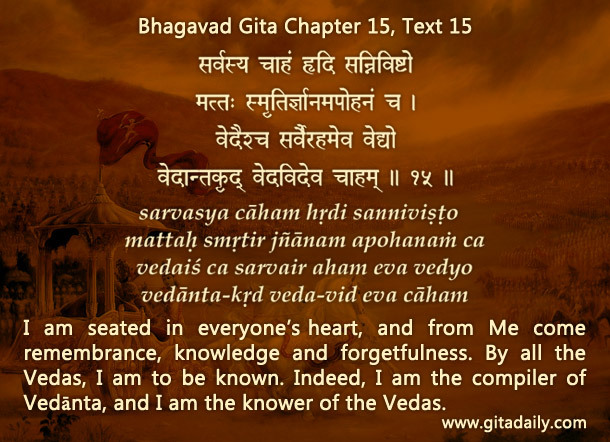 And he declares in the Bhagavad-gita (15.15) that the ultimate purpose of all the Vedas is to know him. This is not a self-promoting claim of an egoistic speaker – it is the philosophical truth shared by the supreme seer, the Absolute Truth manifesting in a personal form. The Vedas are meant to fulfill our desires, and the deepest of our desires is the desire to love and be loved. Indeed, nothing can satisfy our heart as fully as love. Krishna, being the all-attractive, all-loving Supreme Person, is the object wherein our loving propensity finds perfect and perennial fulfillment. Vedic wisdom comprises a progressive program for increasing our faith by satisfying our many surface desires till we take the leap of faith towards loving the one who will fulfill our deepest desire. What the Vedas point towards, the Gita focuses on. Thus, the Gita takes us from the voluminous ambiguous multi-level guidelines to the top-level goal of all the guidelines: Krishna.